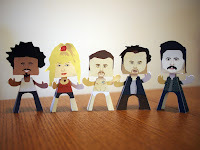 These paper people are from the TV comedy series “My Name Is Earl”, the papercrafts are designed by sally. My Name Is Earl is an American television comedy series created by Greg Garcia that was originally broadcast on the NBC television network from September 20, 2005, to May 14, 2009, in the United States. It was produced by 20th Century Fox Television and starred Jason Lee as the title character.